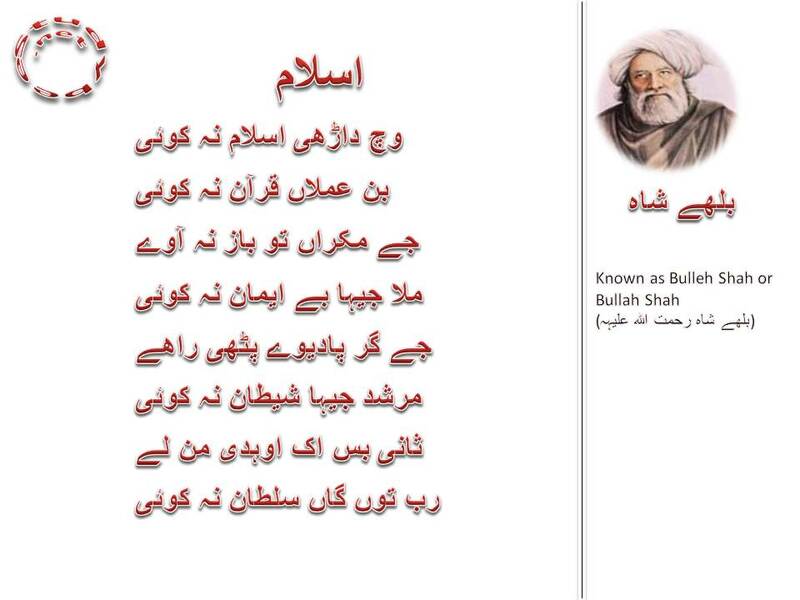 ‘Wich darhi islam na koi’ by Bulleh Shah is a poem on the essence of religion and Islam. Appearances are often deceptive, so is the case with religion and religious leaders. Bulleh Shah states that religion, Islam in this case, does not exist in the mere appearance of beard. Islam is the name of practicality and effective following of one’s religious teachings. Islam, with all its teachings in the Holy Quran, is meant for practical applicability of Quranic verses rather than mere rhetoric. Bullah calls all such mullahs and religious leaders as “Satan”that use the holy book for their personal gains. While discussing about fake mullahs and religious leaders, Bullah refers us to Quran and God alone; he asks us to follow the instructions laid down in the Holy Quran as our foremost guidelines. So, the message is vivid and loud; religious zeal and appearances are two entirely different horizons. Life of purity comes from original sources in originality; it does not have anything to do with the appearance and display.